We pride ourselves on delivering our customers the best platform in the world. In plain English a Content Management System or CMS is a website software that makes it easy for you to add and edit words, pictures and other things to your website. PowerSites is Telligence's in house developed enterprise level Content Management System that has been used by over 700 websites across Australia. The PowerSites website platform uses advanced technology and architecture and we don't stop there - our team is dedicated to continually adding in new functionality and enhancements. We are continually updating the website platform software so your website is always up to date with the latest software, performing at its best with the latest security patches installed. You can relax knowing that our website systems have NEVER EVER been hacked. PowerSites security has never been compromised unlike many open source products being used by our competitors. With add on modules and with all of our systems developed in-house, our website solutions can grow, change and adapt alongside your business. This is unlike many inferior products in the market-place. Our web developers can extend the PowerSites platform to accommodate your unique online business requirements in addition with our completely custom web development services. 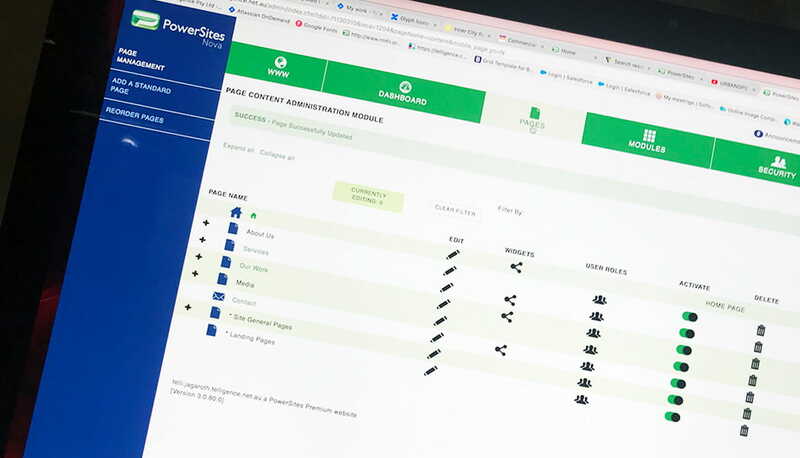 Easy to use, reliable, secure, fully supported and updated by us, your PowerSites CMS will be the last website system you'll ever need to buy. Care Plan and Monthly Subscription - our promise to you! Unlike our competitors who wave you good bye once your site is live, at Telligence our client relationship never stops. We are here to support you, your website AND your business all the way and that's a promise. As part of our service, we promised to supply you with unlimited technical support during the life of your website. This means if you need help, there's help available and we won't sell you any bills for the privilege. Maintenance and updates to CMS Software - Our CMS is used by clients Australia wide, we maintain this platform and update it regularly to deliver you a quality experience. Regular code and maintenance updates to maintain our bullet proof web application. Hosted in Australia and managed by Telligence - Our sites and systems are all hosted in Australia and managed by us through Austiger Hosting. Our system has never been hacked and is always monitored for uptime. Training - We will train up to 4 team members to learn how to use and maintain your new website. Plus you can then access free basic PowerSites training and always be up to date with the latest in PowerSites technology. Account Management - We are your experts. You will have access to professionals to make sure you are always up to date with the latest web technologies. Ticket, Email and Online Support - Access to our team of local support experts based in Australia. Impeccable Hosting Environment - Hosting of your site in an Australian-based multi-data centre redundant region to ensure a 99.99% uptime in the cloud at lightning fast speed. Monitoring - Monitoring and management of your sites hosting facilities to ensure uptime and performance. Looking for help with your PowerSites Website? What Makes PowerSites So Amazing? At Telligence, we can help make sure you are making the right decision getting a PowerSites website that will work as hard as your business does. With the Team at Telligence and a PowerSites CMS website, you can rest assure that together we can take out the difficulty of setting up and maintaining your website. The PowerSites website platform uses advanced technology and architecture and we don't stop there - our team is dedicated to continually adding new functionality and enhancements. We are continually updating the website platform software so your website is always up to date with the latest software, performing at its best with the latest security patches installed. We are proudly Australian owned and operated and your website will be hosted, updated and supported by our customer service team from our Newcastle office. We look after the entire process in-house for you including design, development, hosting and support, even after your website goes live! We are here for the life of your website. You can relax knowing that our website systems have NEVER EVER been hacked. PowerSites security has never been compromised unlike many open source products being used by our competitors. Rest assured your website is in good hands. Telligence have been delivering websites for over 15 years to all types of businesses ranging from large government bodies, to start-up business. With over 50 modules and all of our systems developed in-house, our website solutions can grow, change and adapt alongside your business. This is unlike many inferior products in the market-place. Your website will always be available, we guarantee 99.99%* connectivity and provide ongoing support by email, our mobile app or by phone. Someone is always ready to help you when you need it.